For a true motorhead, it is pretty remarkable to go more than five years without a new car. It is even more remarkable to do so when his only car is 17 years old and was largely engineered by Italy’s not-so-finest three decades ago. But that is exactly the situation I was in when I finally decided it was a fantastic time to buy a new sports car. Much kudos goes to Elaina—the Alfa Romeo that amazingly turned out to be the second most reliable car I’ve ever owned (after the BMW Z3 which was brand new and fully warrantied while I had her)—for lasting so long despite being put through vigorous tests such as the Great American Western Road Trip. But wait? Did I just write it was a fantastic time to buy a car after the stock market had plummeted deeper than a Chinese diver, unemployment rolls are swelling more than than a banged-up knee, and financing is more unavailable than Jessica Alba? Well, it is for those with ample savings and can put out cash. In my case, I was also probably the only person north of Cuba who was actually looking for a convertible in December. All these factors put me in a very strong position as a buyer. The only problem was finding the car I wanted in December. Sports cars are pretty rare in Colorado, especially high-end ones. My solution was looking for one in the San Francisco Bay Area while on winter vacation, where they are a dime a dozen. 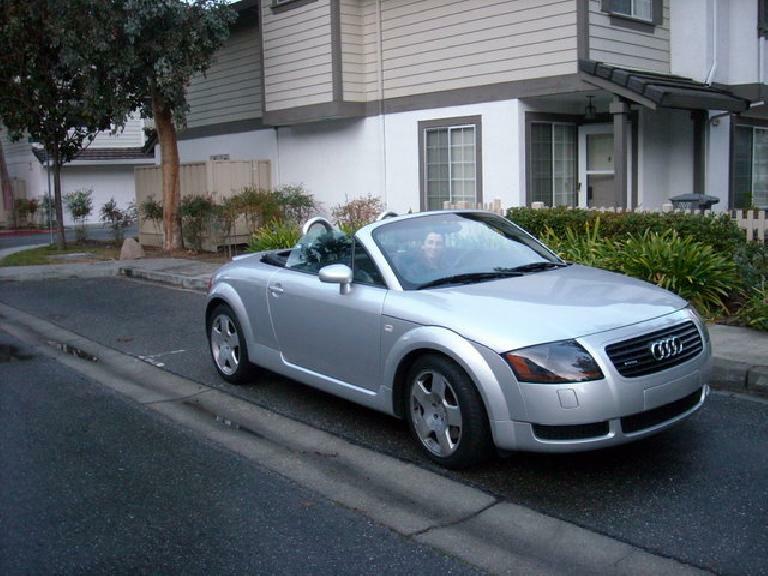 I inspected and test drove three and after playing hardball negotiating on the best one, came away with this like-new Audi TT Roadster Quattro with 68,250 miles for nearly 20% under Kelly Blue Book value. She had only one previous owner—“a grandma in Marin” who must have been a rower since there was a OWRC parking sticker on the windshield—but I purchased her from an auto broker in San Jose. After a few weeks with her (including a 1,150 mile drive from California to Colorado through -16F temperatures), I have to say I am in love with the car. Her name is Teeter. To begin with, she is something of a hybrid of every sports car I’ve once owned. The stylish, elegant interior replete with simple, round shapes and metallic accents reminds me of my ’74 MGB‘s despite being much more avant garde. The deep, mellow exhaust note has overtones of Goldie‘s, just at half the volume. The turbocharged four-cylinder engine puts out about the same amount of power (and turbo lag!) as the Porsche 944 Turbo‘s (225 vs. 217 hp), but is only 1.8 liters in displacement just like that of the MGs. Her ride quality, handling, and ultra-precise short-throw shifter is contemporary like the BMW Z3‘s, along with modern touches like a power top, side airbags, and behind-the-headrest roll hoops. All-wheel-drive. All my cars had been rear-wheel-drive. The Quattro system adds 300 pounds, but is well worth it in adverse weather and enhances the handling. Heated seats! This was a must-have feature for me since I have a habit of driving with the top down even in the midst of winter. Soooo luxurious. Six-speed transmission. This aids acceleration and enhances fuel economy. In fact, even with Quattro and 45 more horsepower than the base TT Roadster, fuel economy is only 1 mpg less in the city and highway (18/26 vs. 19/27). Yet, the factory claimed 0-60 acceleration time of 6.7 seconds is quicker than any car I’ve had except for the Porsche. Glass rear window. It won’t crease, discolor or shatter. It also has an electric rear defroster. Power glass rear windscreen. This helps reduce drafts in the cockpit. With the rear windscreen and side windows up, wind buffeting is far superior to any other convertible I’ve owned. Automatic climate control system. The heater and defroster (and, I presume, the air conditioning—I haven’t really tested that out since it’s winter) make the MGs’ or Alfa Romeo’s seem Fred Flintstonian. Audi Concert premium audio system. It cranks out 175 watts of seat-thumping bass and has a six-disc CD changer (and cassette player which won’t get any use). It’s much better than that in the BMW Z3’s (which blew out the subwoofer at high volume with the top down—fortunately it was replaced under warranty). Teeter is the first car I’ve had that makes music sound nearly as good as my home setup, or at least the Shaker 500 system in the Ford Mustang I drove around in New England last spring. Navigation. It’s one of the earlier systems predating the now typical touch-screen systems (its monochrome LED readout only shows arrows in the middle of the gauge cluster, not a detailed LED screen in the middle of the dash). It also uses CDs for the data (with no updates after 2003), but it is still nice to have especially when I don’t want to carry around my Garmin. Trip computer. In addition to showing average speed and mpg, it estimates how many more miles one can drive before the gas tank is completely empty. Especially useful has been instantaneous gas mileage—it’s taught me how to drive more efficiently (more on this later). Keyless entry. Ok, virtually every rental car has that, but none of my cars ever did. Some sort of interior radar system that sounds an alarm upon intrusion when the top is down but the car is locked. Some sort of sensor system that alerts the driver there’s something in the convertible top well while he is trying to lower the top. Tilt and telescoping steering wheel. This enables one to custom-fit the driving position to his tastes. I have Teeter set up for a more British-esque driving position than the strange Italian one. Seats with adjustable height. I have the driver seat at a pretty high position so I can comfortably rest my left arm on top of the door with the top down. So unlike in my other roadsters, I no longer feel like I’m sitting on the floor. Seat-deployed side airbags. The side airbags in the Z3 were located in the doors. Xenon headlamps. Well, I think the Beemer had them too. At least they were also really bright. Heated mirrors. I think my Porsche 944 Turbo had them, but they were an option on the BMW Z3 that I’m pretty sure I did not get. 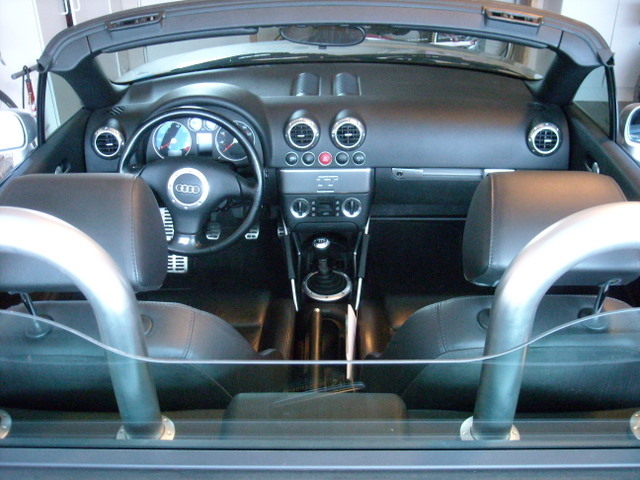 However, as with the Z3 there is almost no space behind the seats except for the shallow area beneath the convertible top when the top is up (useful when needed, but then one can’t put the top down). There are a few cubby holes in the interior that my other cars didn’t have too. 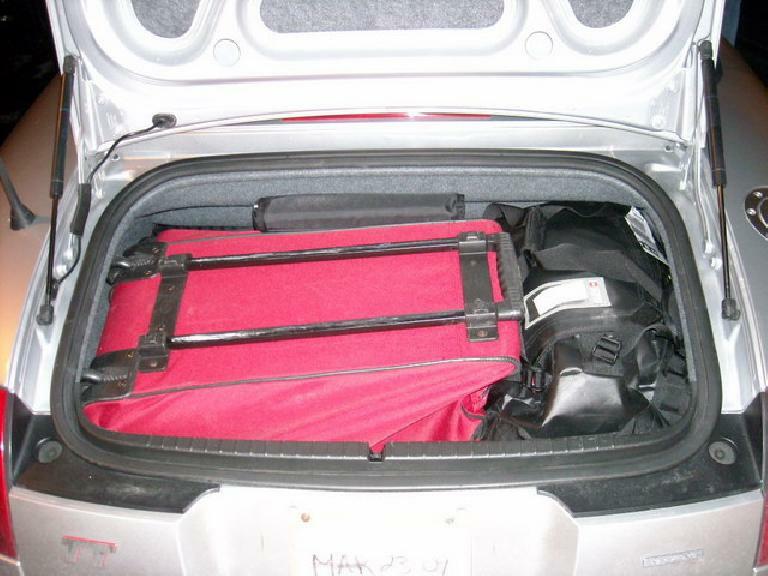 To carry a bicycle, I’m planning on installing a hitch or license plate-mounted rack. For bicycle transport to events too far to bike to, I just rent a car. This saves wear and tear on the TT. This (25-27 mpg) was still pretty disappointing, but I was also driving in frigid conditions (sometimes with rolling resistance-increasing snow on the ground) and driving at speeds between 75-80 miles per hour. Also, I was using the cruise control which I had mistakenly thought would help increase gas mileage. In fact, cruise control can actually hurt mpg especially on hills versus judicious throttle modulation (e.g., letting the car slow a little on the uphill and speed up on the downhills). Keeping the latter in mind, I did another test when going to the Denver International Airport and back to Fort Collins which entailed about 20% city driving (since I also did some errands in Fort Collins) and 80% highway miles. With careful modulation of the gas pedal, judicious coasting and avoiding excessive speeding, the trip computer recorded an astounding 33.4 mpg over about 200 miles. That’s even better than the Alfa typically gets (it usually gets 30-32 mpg, though I’ve gotten as much as 36 mpg on one segment of the Great American Western Road Trip). Pretty remarkable considering the TT’s engine can put out nearly twice the power. So what has already become the favorite of any car I’ve ever had, it’s also being one of the more environmentally friendly ones as well. It’s a pretty good bet I’ll be keeping her for another five years. February 25, 2009 (Wed): Teeter inherits the custom Colorado plates from Elaina. Click here for their significance. Hey! I have a little TT as well. 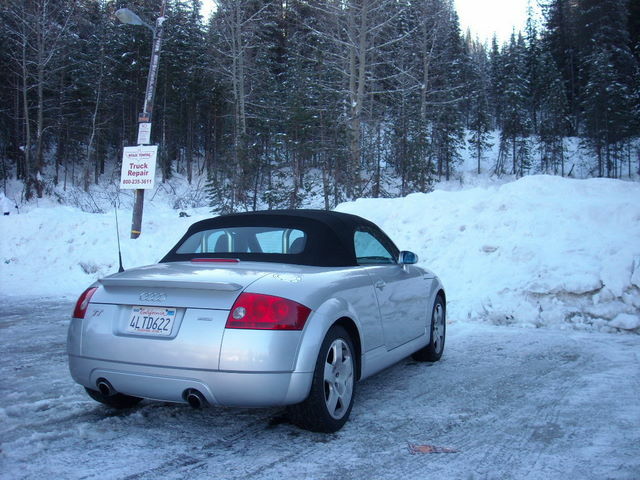 Mine is 2004 hardtop quattro 3.2, in blue! Love it! 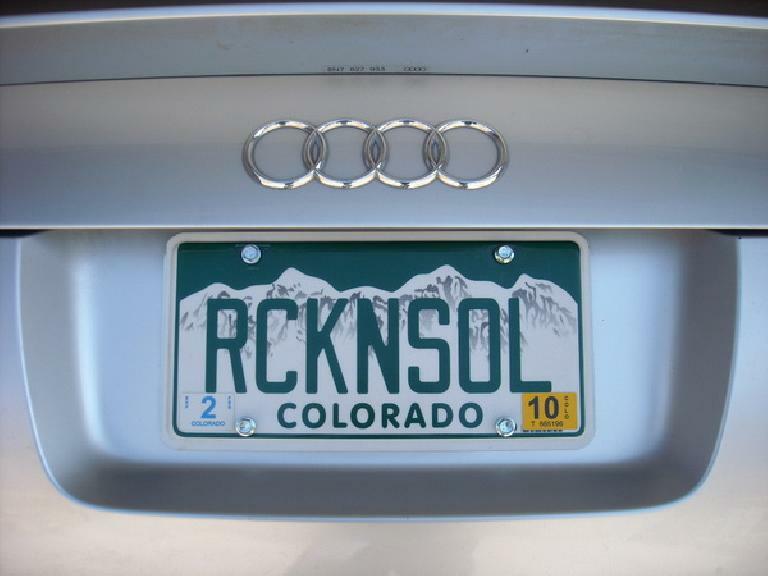 How is yours on the road in CO? I am moving to Ft Collins in July. Hey I just got a tt as well. An 04 hard top in yellow. Mine also says 99.59h cuz it maxed out but I don’t know how to reset it! I know it’s on the wiper bar but when I press the reset button everything goes away and doesn’t reset it. Or tell me the mpg. Can someone plz help? Congrats on your ’04! To reset the hour counter, press (hold down) the same reset button for 1-2 seconds. It will then reset to 0. Same goes for the other functions — e.g., to reset the average MPG, toggle the switch at the end of the wiper bar to the average MPG screen, then hold down the reset button. How does the latest iteration of this roadster look like? I hope the current models are much better at handling the wind noise and buffeting issues. The problem was so overwhelming on my drop top that I had no other option but to mount an additional wind deflector. But after the retrofit, my cabin is hush and the roof-down cruises are truly delightful thanks to the BackBlade windblocker. But I think wind buffeting the my first generation TT Roadster is pretty good—at least with the rear wind screen and both windows rolled up. With the windows rolled down, the rear wind screen does not make much of a difference. Wind buffeting is far better than my former MGBs, and a bit better than the Alfa Romeo Spider and BMW Z3 Roadster I used to own. Sounds like you have a good solution, though. The BackBlade windblockers look pretty nice! Wind buffeting is kind of a norm on roadsters. Some have a lot, some have less. Well, coming to wind deflectors… I have a Windblox windblocker on my ride and it’s pretty good at tackling the buffeting. I must say more than 90% of the buffeting and turbulence have been cut down by this equipment. Yeah, I too agree with you on that. Backblade windblocker is quintessential equipment when it comes to tackling wind noise and turbulence. In fact this accessory was suggested by my car technician after having had to put up with the overwhelming slap of wind on my noggin.